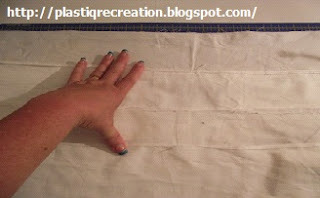 Since creating the tutorial on how to make blue jean yarn (http://plastiqrecreation.blogspot.com/2009/10/how-to-make-handspun-blue-jean-yarn.html), I've learned with experience that once a seam is cut into, it becomes compromised making it vulnerable to falling apart. So while I'm in the process of making something, it falls apart. I have been lucky enough that some seams that are cut through are sewn stronger and stay in tact even after the fray process. But the majority of time I end up with multiple strands of various lengths. As a result, I spend more time than I want sewing the ends together. And, yes this can be time consuming. 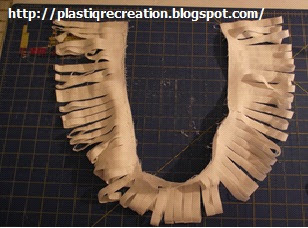 If there is a way to make yarn in a single strand with a tube, then there is a way to make a continuious strand of yarn without a tube. 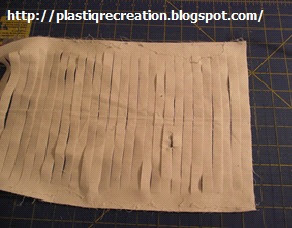 I could use the 'make a slit and connect the strips' but that for me is just too time consuming. If you haven't learned by now, I am impatient. After much practice, I finally figured it out. 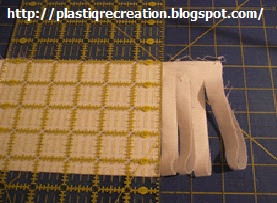 The awesome thing is this cutting method can be used on any type of material like sheets, curtains, etc..
Cut legs off below crotch. Cutt off bottom hem or pull out the stitches of bottom hem. 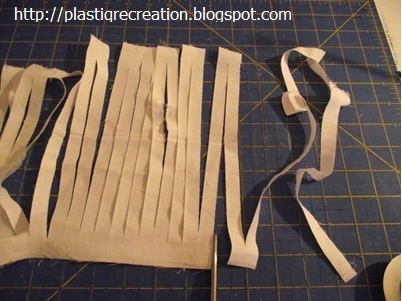 Take one layer and match up the sides lengthwise. Lay flat on cutting board. 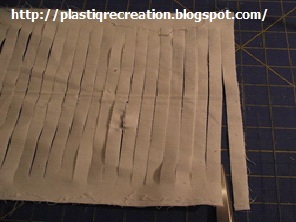 Starting at right edge, measure in desired width of strip, cut through bottom fold up to approx. 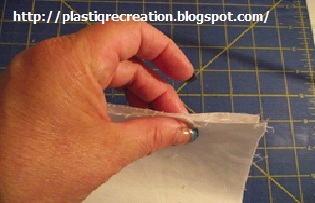 1/4" to 1/2" below top edge. 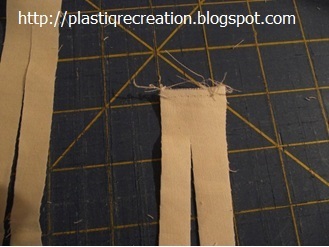 Recommended width for each strip is not less than 1/2". 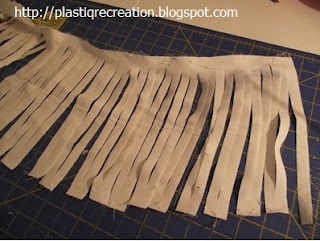 This is what it will look like when cutting is done. Starting at bottom edge, cut through to make 1st strip. 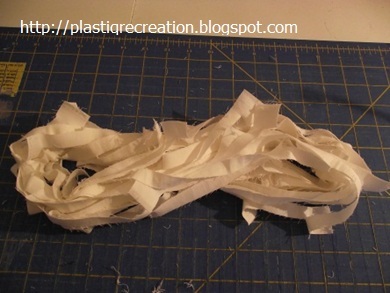 Each cut after 1st will be every 2nd strip to end. This is what it will look like when all done. Now working on the opposite side. 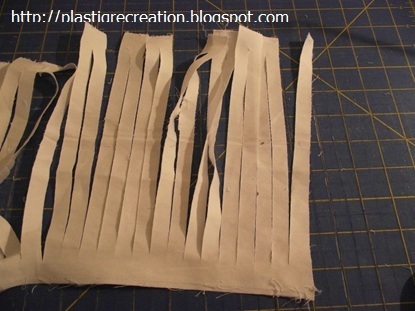 Starting at bottom edge, each cut will be opposite of other side. If it helps, the strip looks like an upside 'V'. 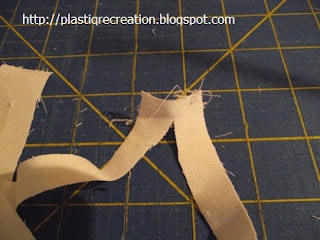 Cut through the middle of the 'V'. 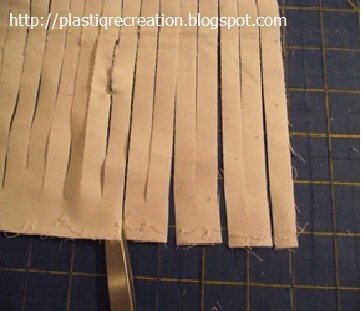 After the continuous strip is completed, go back and look at the strips and cut closer to the edge. Not too close because you want it to hold up through the wash and driy process. Here is what it looks like right after cutting but before wash/dry processing. The wash & dry process gives yarn the frayed look. Here are a few other pant yarns that I have made. I would love to know what types of yarn you make with this tutorial. Let me know if additional clarification is needed. By all means don't hesitate to email me at plastiquerecreations@yahoo.com if you have any questions. 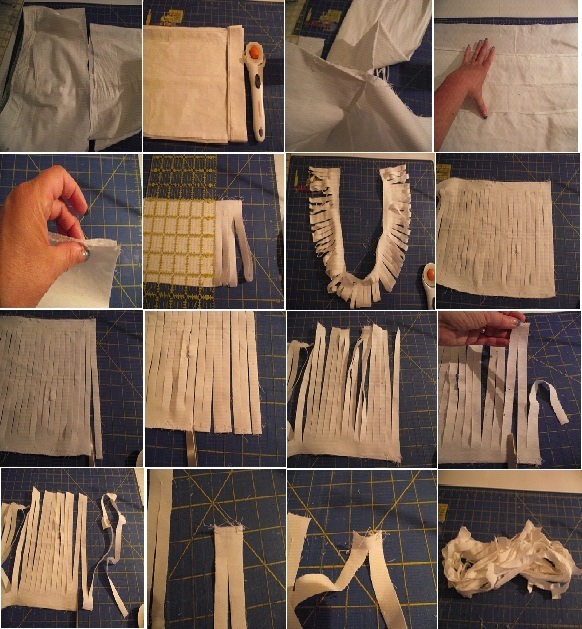 What have you made with your denim yarn [Is it Darn? !] I thought of totes - should be strong. Hi - lol - never really thought about giving it a name .. not sure about 'Darn' only because I make pants yarn from khaki's and sweat pants. As far as what I've made with pants yarn, several skinny scarves, totes and even bracelets. Pants yarn is very easy to crochet and knit with. 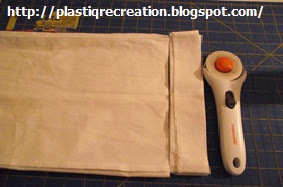 This tutorial is equally suitable for cutting 'tarn' from t-shirts (only don't rip open the seams, neatly cut them out). I love to crochet with it, but recently picked up knitting. Thanks for sharing! 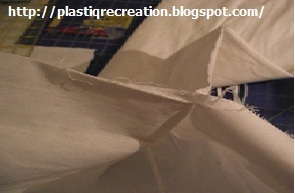 You're exactly right, Le-Chat, this method can be used on those types of t-shirts that have side seams. 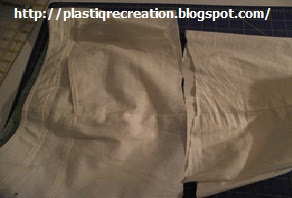 But I really love using this method for curtains and bed sheets. 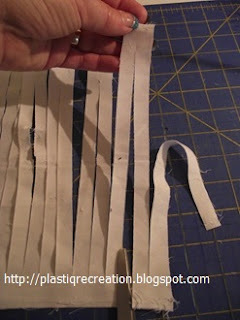 Please send me pics of your recycled yarn made with this cutting method so I can show it off ..